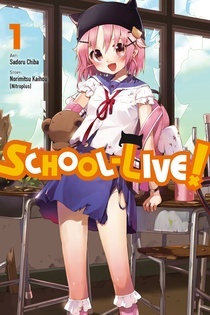 The school club has long been an important part of the Japanese high school experience, but perhaps it's never been more important than for the girls of Megurigaoka Academy Private High School in School-Live! Volume 1. The founding principles of the School Living Club are really pretty simple: to best utilize the facilities of the school, it is imperative that the members live their entire lives in the school. It's not the largest of clubs; in fact, besides the faculty adviser Megumi Sakura, there's only three members right now. But they're the most earnest, devoted members a club could wish for. Yuri Wakasa is the club president. She is in charge of all of the club activities, and plans the practical aspects of the club's adventures. She's also oftentimes found on the school roof, helping with the gardens that the Agriculture Club have there. Kurumi Ebisuzawa is the tough girl of the group. She's the one who plows through obstacles, and makes sure that all of Ri-san's plans turn out as expected. She's never too far away from her shovel, so perhaps she likes to help out the Agriculture Club as well. Which brings us to Yuki Takeya, the heart of the club. No matter what problems the School Living Club faces, from rainy days to possible ghosts, Yuki's smile is what gets her clubmates through the day. While a club based solely on the school in which it takes place might seem dull, there's always something to do in this remarkably well-provisioned and self-sufficient school. And as the girls grow closer, they've made a pact to graduate together, no matter what. Highs: Even though the girls and their teacher each fill a very traditional role in a schoolgirl manga, even in this first volume they each have enough personality to draw the reader in immediately. Lows: It's still odd that a school would allow a group of students to live in a classroom though. Verdict: A very cute manga that has more depth than it seems at first glance.